In a perfect world, there is no need to have safes at home as there are no thieves who will break in and steal valuable stuff. However, in the present real world, a safe box is considered one of the must-haves of every home. Important belongings such as pieces of jewelry, documents, flash drives, passports, and more need to have a safe box which can protect them from fire, water, and of course, theft. Investing for a safe is a worthwhile choice you want to safeguard your precious valuables. By having a safe, you can have a peace of mind at home for security and safety of those significant treasures. – There is a wide variety of safe box in the market today that can fit your budget. These safe boxes will vary in features when you consider the cost. – If you want a good quality safe, you need to look for a fire-proof safe which means this safe can comply with safety tests that can protect belongings from high-temperature surroundings in case of fire hazards. – The same with fireproof, the safe you will select must also be waterproof which can withstand high-level waters in case of flooding in your area. – Lastly, if you want to buy a safe, you need to consider which type will suit your need. There are portable safe that can be carried around and there are models that need to be mounted inside the house. 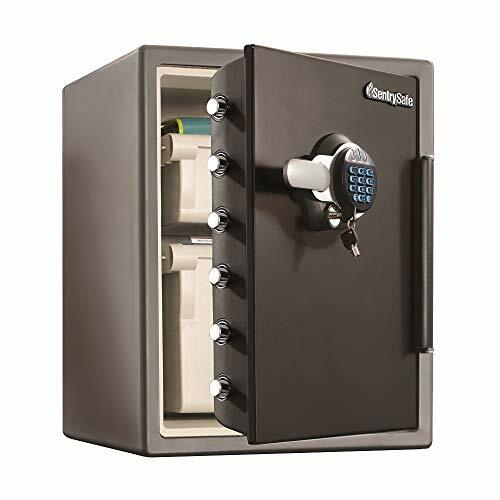 If you need a safe place to keep important things such as pieces of jewelry, passport, cash, and other irreplaceable stuff, then the SentrySafe Fireproof and Waterproof Safe is the best choice you got. Aside from being an affordable safe, the SentrySafe is fire resistant. It can guarantee to protect your belongings from high-temperature surroundings or in case of a fire for more than half an hour. This safe box is UL-Classified which means it can protect your most important belongings including documents for an hour at 927 degrees Celsius. The SentrySafe is also ETL-verified which means it can offer protection to electronic devices such as USB drives, flash drives, DVDs, and CDs. The safe is portable and comes with a handle that lets you carry it on your car, hotel, or wherever you prefer. The SentrySafe is also water-proof which can keep your things from the water up to eight inches deep in case of a flood. 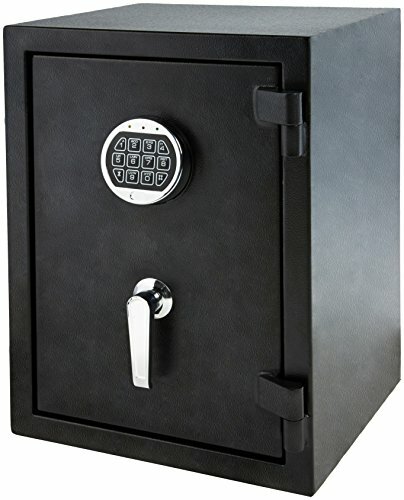 In addition, this safe box has a digital lock with backlight and a secondary locking key system for manual operation. You can set your very own digital lock combination up to 8 digits. It comes with a backlit keypad that allows you to see the combination especially when placed in a dark area such as the closet. The secondary locking system allows the owners to disable the primary digital lock in the event that other people know the access code. It also comes with easy-to-access compartments for batteries for changing. Another feature of this safe box is that it can resist a 15 feet impact in case the owner drops it. For full protection of valuable belongings from theft and fire, you can select the AmazonBasics Fire Resistant Safe. It is a durable safe that can safeguard your important papers, pieces of jewelry, passports, digital media, and other important possessions. This fire-resistant safe box can give you peace of mind by offering a layer of protection for your important stuff. The Amazon Basic Safe comes with heavy-duty steel on its body which gives reliable and durable strength with five large bolts attached to it which can guarantee long-lasting protection. The Amazon Basic Safe is verified with UL 72 Standard and had passed the safety test for Fire Resistance of Record Protection Equipment up to 20 minutes. You can lock and unlock the safe easily and quickly by its electronic keypad for easy access at any time. It also comes with a back-up key for emergency use. The inner shelf of this safe can be adjusted. It can be divided into compartments depending on the preference of the owner. 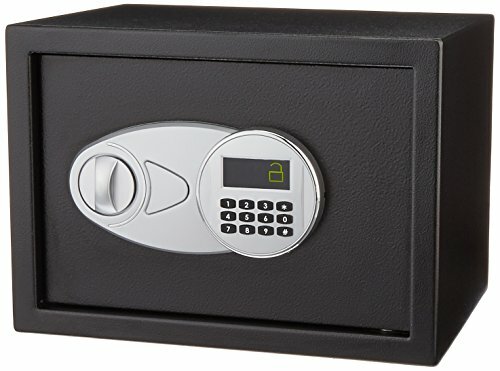 The AmazonBasic Security Safe is an affordable and reliable safe for your important belongings. It is made of pry-resistant steel which offers long-lasting performance and reliability. It can provide the same level of security being offered by your office, hotels, and anywhere else. The safe comes with an easily-programmed numeric touch for easy access and retrieval of stuff and a back-up key for emergencies. You can find a splitting storage space into sections inside the safe. The bottom section is carpeted which keeps your valuable away from possible scratches. This safe is ideal for couples who want to share the same storage but keeps them sorted or separated inside. The Amazon Basic Security Safe comes with mounting hardware making it easy to install on the floor, shelf, or wall which can be difficult for theft to take. The Amazon Basic Security Safe has an electronic lock system which provides quick and easy operation. The owner can reprogram the safe with his unique passcode. There are two emergency override keys for emergency purposes. It also has a digital display which shows low battery, locked, and unlocked mode. In terms of protection and security, these products mentioned above are one of those solid choices when it comes to safety. If you are interested to buy one, make sure to consider personal preferences such as the type of protection you need before purchasing one.